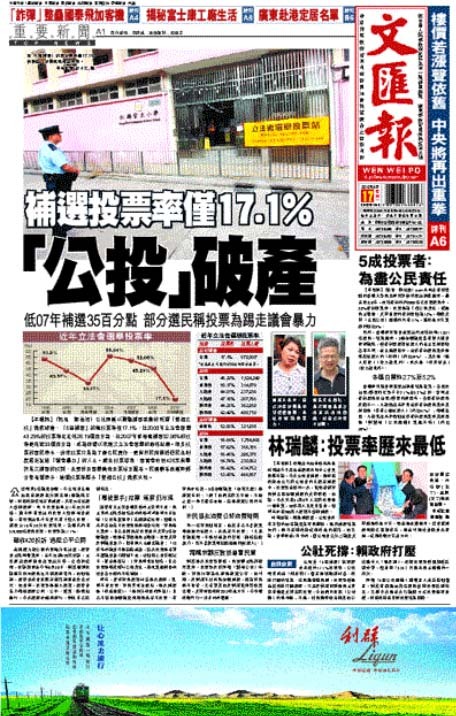 (South China Morning Post) Low turnout in by-elections deals blow to pan-democrats By Ambrose Leung and Gary Cheung. A record low turnout at the Legco by-elections yesterday dealt a blow to a campaign that had been touted as a referendum on universal suffrage. Only about 579,000 voters, or 17.1 per cent of 3.37 million eligible voters, turned out amid a chorus of discouragement by top officials and government allies. 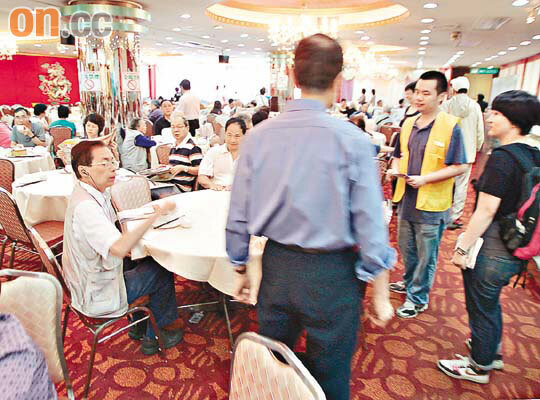 Although supporters declared the exercise a success, total vote share for the camp was at least 300,000 votes below the support it received in the 2008 Legislative Council election. The elections were triggered by the resignations in January of five pan-democrat lawmakers who hoped to offer voters the chance to show they wanted "genuine" democracy. But Beijing condemned the exercise, government-friendly parties declared a boycott and Chief Executive Donald Tsang Yam-kuen and his ministers said they would not vote. All five lawmakers - Tanya Chan and Alan Leong Kah-kit of the Civic Party, and Leung Kwok-hung, Wong Yuk-man and Albert Chan Wai-yip of the League of Social Democrats - were re-elected with comfortable majorties, according to official results released this morning. On Thursday the league said it would consider the by-elections an "unprecedented success" if turnout reached 25 per cent. Speaking after polls closed, Civic Party leader Audrey Eu Yuet-mee said the turnout was satisfactory. "It is the biggest mobilisation since the July 1 demonstration in 2003, when 500,000 took to the streets. Each of the 500,000-plus votes counts and the government must respond to public demands for democracy." According to an exit poll by the University of Hong Kong, more than 50 per cent of 2,000 respondents said they had voted to fulfil their civic duties. Sixty-five per cent said they backed the "de facto referendum", and 59 per cent said they opposed the government's reform proposals. In the 2008 Legco election, the Civic Party and the league, together with their allies, received 881,184 votes in the five geographical constituencies, winning 19 seats. Despite 24 contestants taking part yesterday, there was little election atmosphere, with the five former lawmakers the only visible campaigners. Many lesser-known candidates did not even put up a fight during the 15-hour polling period. Tsang broke with his habit of going to Sunday Mass in the Wah Yan College, and made no public appearance all day. Speaking after visiting a polling station, Stephen Lam Sui-lung, secretary for constitutional and mainland affairs who did not vote, said: "The turnout rate is the lowest since the handover for Legco general elections and by-elections. It indicates a rather low level of support. Our judgment is that these by-elections could have been avoided, and the mainstream public opinion did not support this exercise." One of the few major public figures to back the by-elections was Catholic Cardinal Joseph Zen Ze-kiun, who said: "Without a democratic system, there can be no improvement in people's livelihood. This referendum is an unusual chance for us to demonstrate our anger through peaceful means." Of the five constituencies, the highest turnout by 9.30pm was 19.51 per cent in Kowloon West, where Wong was challenged by Pamela Pak Wan-kam, a former agony aunt. "No wonder we are getting this result because of the total boycott by government supporters and the pulling back of support by our pan-democrat allies," Wong said. Turnout was lowest in the New Territories West constituency - at only 13.41 per cent an hour before polls closed - where Albert Chan was trying to regain his seat. Without credible challengers, both Leong and Leung had been running what some had seen as mundane campaigns in Kowloon East and the New Territories East. An official said the by-election had distracted discussions of proposals for the 2012 elections. "The low turnout rate may ease the pressure on moderate pan-democrats who are seeking dialogue with the government," the official said. But Democratic Party chairman Albert Ho Chun-yan said the results would not affect his party's resolve to veto the proposals if no major concessions were made. Chinese University academic Ivan Choy Chi-keung attributed the low turnout to confusing messages put out by pan-democrats and the boycott by government allies. Tam Yiu-chung, leader of the Democratic Alliance for the Betterment and Progress of Hong Kong, said the by-election ploy "was a failure". 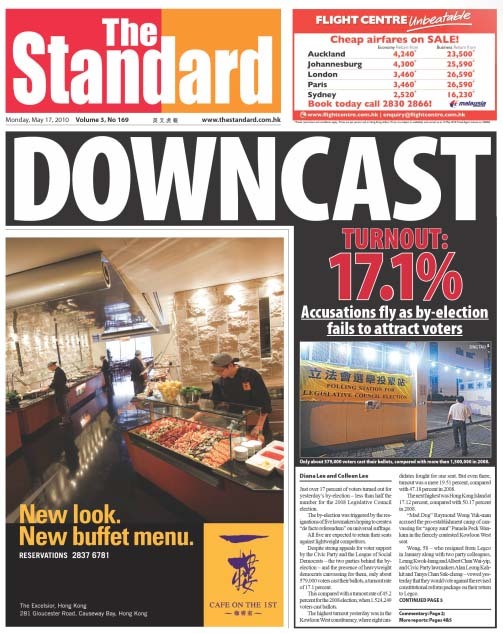 (The Standard) Downcast. By Diana Lee and Colleen Lee. Just over 17 percent of voters turned out for yesterday's by-election - less than half the number for the 2008 Legislative Council election. The by-election was triggered by the resignations of five lawmakers hoping to create a "de facto referendum" on universal suffrage. All five are expected to retain their seats against lightweight competitors. Despite strong appeals for voter support by the Civic Party and the League of Social Democrats - the two parties behind the by-election - and the presence of heavyweight democrats canvassing for them, only about 579,000 voters cast their ballots, a turnout rate of 17.1 percent. This compared with a turnout rate of 45.2 percent for the 2008 election, when 1,524,249 voters cast ballots. 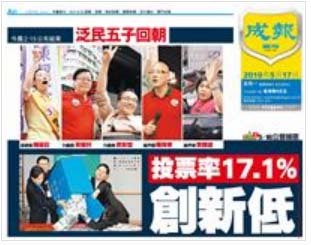 The highest turnout yesterday was in the Kowloon West constituency, where eight candidates fought for one seat. But even there, turnout was a mere 19.51 percent, compared with 47.18 percent in 2008. 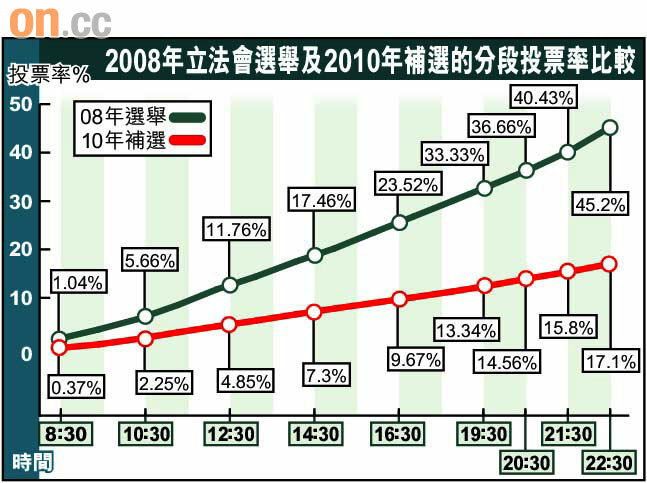 The next highest was Hong Kong Island at 17.12 percent, compared with 50.17 percent in 2008. 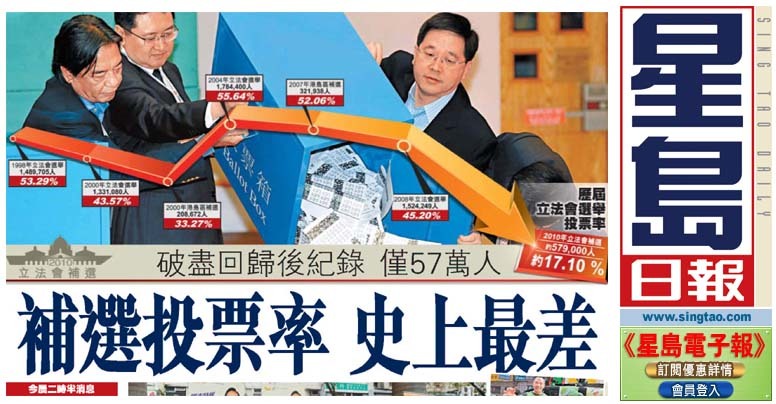 "Mad Dog" Raymond Wong Yuk- man accused the pro-establishment camp of canvassing for "agony aunt" Pamela Peck Wan-kam in the fiercely contested Kowloon West seat. Wong, 58 - who resigned from Legco in January along with two party colleagues, Leung Kwok-hung and Albert Chan Wai-yip, and Civic Party lawmakers Alan Leong Kah-kit and Tanya Chan Suk-chong - vowed yesterday that they would vote against the revised constitutional reform package on their return to Legco. "The pro-establishment camp, including the DAB and Federation of Trade Unions, canvassed for Pamela Peck in stealth by, for example, setting up booths," Wong said, referring to the Democratic Alliance for the Betterment and Progress of Hong Kong. "I expected that but she is definitely going to lose." 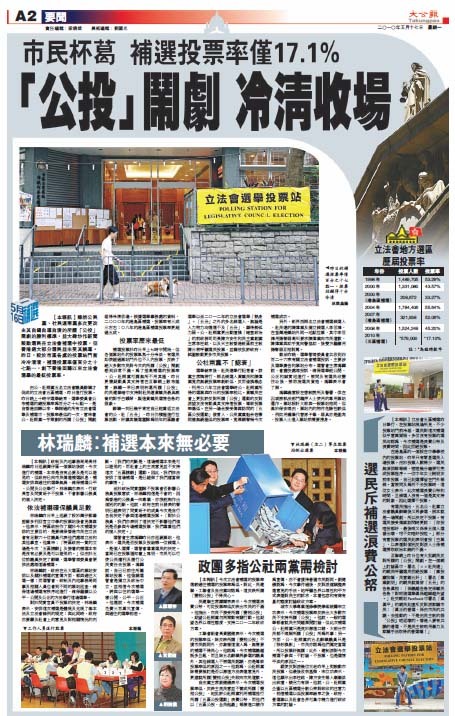 Wong claimed Kowloon West residents had received calls from FTU representatives asking them to vote for Peck, and some of those who handed out Peck's leaflets in the street were the same as those who canvassed for Priscilla Leung Mei-fun in the 2008 elections. Wong also said the battle in Kowloon West seat was not between him and Peck but between universal suffrage supporters and the pro- establishment camp. While he had hoped for an overall turnout rate of 30 percent, he said he would be satisfied with 20 percent given the government's "suppression" of the by-election, insufficient promotion and the announcement by top officials of their decision not to vote. Peck denied she had help and described Wong's accusation as "very ridiculous." Secretary for Constitutional and Mainland Affairs Stephen Lam Sui- lung defended the decision by Chief Executive Donald Tsang Yam-kuen and his political team not to vote, saying it should not put pressure on civil servants. "Civil servants are professional and can make their own judgment," Lam said after visiting a polling station. "We have indicated that our decision should not affect individuals. We respect the decision of individuals." Electoral Affairs Commission chairman Justice Barnabas Fung Wah said he cast his ballot in the morning. "Whether to vote or not, or vote for whom, a voter should make his personal decision. 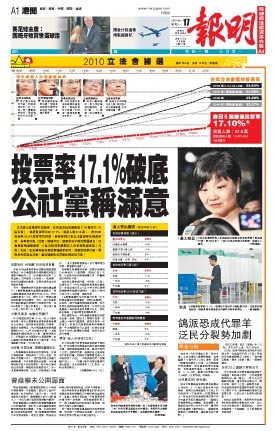 The Electoral Affairs Commission will respect [the decision] of voters," Fung said. As of late last night, the commission had received 426 complaints. Lew Mon-hung, a member of the Chinese People's Political Consultative Conference, said the low turnout rate indicated the de facto referendum was a failure. Lew - who was repeatedly hissed at by the crowd during RTHK's City Forum, which drew a record audience of 450 - said he would not cast his ballot as the by-election was "political sensationalism." Another speaker and commentator, Johnny Lau Yui-siu, said the low turnout rate did not mean the campaign was a failure. "At least it heightened concern in the government and Beijing about the public's view on constitutional reform," Lau said. The first referendum has been completed successfully. In spite of the cool treatment from the government and the attacks from the pro-establishment camp, about 580,000 persons cast votes. The voter turnout of 17.1% was lower than expected, but pan-democrats believe that this referendum has made history as a baptism of democracy in Hong Kong. The five district referendum spokesperson Audrey Eu pointed out that given that almost 600,000 persons have spoken out courageously, the government must answered their demands for eliminating the functional constituencies and implementing double universal suffrage. Our reporter voted in Chai Wan. The atmosphere was very desolate. There were only some black-and-white A4 notices on the way. Once inside the voting station, our reporter was the sole voter. The workers were quite idle. On the sheet of paper where several dozen voter names was printed, almost none of the names have been crossed out (to indicate voting). It seemed that the delayed notices, the covering up of the promotional banners, the public statement by the Chief Executive about his intention not to vote in order to apply indirect pressure on public servants and all the other tricks have been effective. Our reporter conduced an exit poll outside the voting station. Most of the voters said that they came for the referendum. Most of them said that they want Hong Kong to have double universal suffrage, the functional constituencies to be eliminated and they oppose the political reform package from the government. A pan-democrat said that the almost 600,000 voters may be a large number, but it still meant that 300,000 pan-democrats who voted that way in 2008 did not come out to vote. The voter turnout was lower than the 25% to 30% expected by the two political parties (Civic Party and League of Social Democrats). To a certain degree, this has to do with the absence of the Democratic Party election machine and the full pressure exerted by the government. But it also showed that the mainstream public has not fully accepted the path of resistance chosen by the two parties. For those two parties, it will be hard to get mainstream identification and support, because they are still not the mainstream within the pan-democratic camp. But the pan-democratic parties other than these two parties were not winners either. The Civic Party and the League of Social Democrats got more than 100,000 more votes than they did in 2008. Those votes clearly came from mainstream pan-democrats. "That is to say, even if the two parties are not mainstream, they have seized at least 100,000 votes from the pan-democrats. Those votes may not all revert back to the other pan-democrats in the 2012 elections." Therefore, the mainstream pan-democrats need to evaluate their future path after this five district referendum. The pan-democrats are worried that the election results fully show that the central government and the SAR government will do everything they can to manipulate public opinion. "When Beijing said that the referendum is unconstitutional and the government/pro-establishment camp refuse to mobilize voter turnout, several hundred thousand people do not vote. You tell me how awesome Beijing controls Hong Kong." Faced with these invisible hands, the pan-democrats will face more hardship when they try to get double universal suffrage in future. The vote tally has been completed. 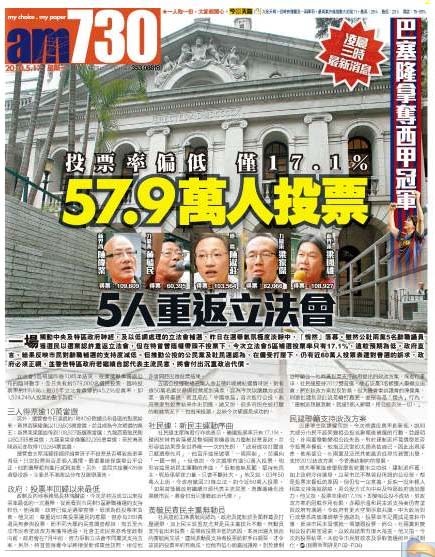 The five former Legislative Council members who resigned previously have all been elected again. 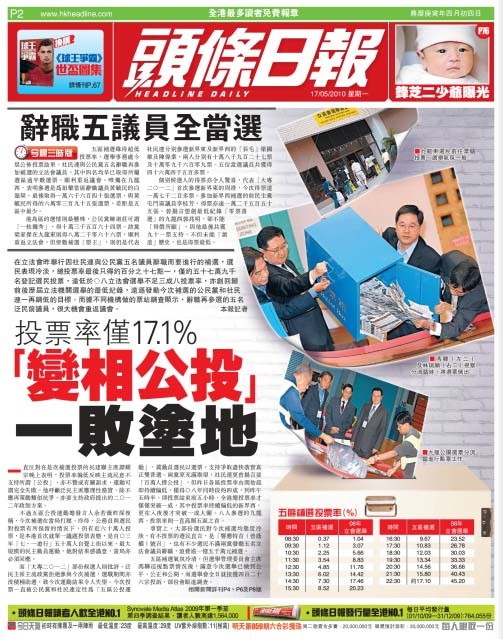 The voter turnout was only 17.1%, which is a new low among all previous Legislative Council elections and by-elections and even District Council elections. The figure was far lower than the 50% target originally set for the "five district resignation/de facto referendum" by the Civic Party and the League of Social Democrats. Scholars characterized the voter turnout as "dismal," showing that the "referendum" has not succeeded. 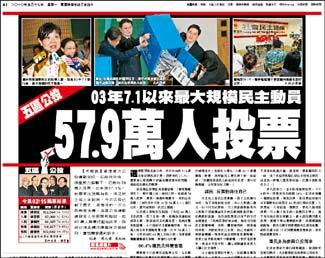 The government spent HKD 1.59 billion on this election, which meant that each of the 579,000 votes cost the taxpayers almost HKD 300. The five district referendum spokesperson continued to insist that she was happy about the voter turnout. She said that this is the biggest democratic mobilization since July 1, 2003. As to whether the "repeatedly revised bottom line" set by the Civic Party was a sign of weakness, she said, "How can it be a sign of weakness when citizens ignore the repeated pressure?" She did not respond to whether she would resign to accept blame. Anson Chan voted yesterday morning in Happy Valley at 8:30am. Afterwards she worked to canvas for voters on behalf of Hong Kong Island candidate Tanya Chan. During this time she and Martin Lee were insulted and scolded by diners in a restaurant. A real estate manager Mr. Tse said angrily to Mrs. Chan: "People's livelihood is the most important thing! Democracy cannot dominate everything else! What is the use of having democracy without people's livelihood?" This by-election is a show! A waste of money!" While Anson Chan has often called for the government to listen to the people's voices, this time she turned around and left before Mr. Tse finished speaking. The group then moved down Chun Yuan Street to solicit support. Once again Mrs. Chan was met with sarcasm from the shop operators. A shop worker refused to accept a flyer from her and wagged his hand: "Go away! Go away! Go away! How come you did not fight for democracy before 1997? Democracy grandma!" 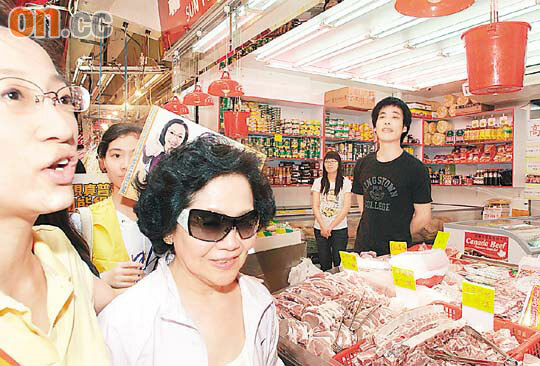 The grocery store owner Mr. Lee started cursing as soon as he spotted Mrs. Chan: "I will definitely not vote! A waste of public funds! You resign on one hand and then you run again for re-election! Waste of manpower and money! Is this a game?" Mrs. Chan turned away when she heard that. Another citizen said this about Mrs. Chan: "She has lots of time on hand? She is putting on a show!" Although Mrs. Chan put on a forced smile, she still looked disconsolate at time. She felt dizzy later in Aberdeen Center and she took a taxi home, canceling her afternoon plans. Martin Lee was also scolded. When he worked with Mrs. Chan in a restaurant, he tried to shake the hand of a diner. But the other party pushed his hand aside and said angrily: "Get lost! Traitor! What a Chinese traitor!" Mr. Lee wiped his smile off and turned his back to leave. Another Mr. Lee who refused to shake his hand also said: "I am not going to vote. They annoy people so much!" Chinese University of Hong Kong Political and Administrative Sciences Department senior lecturer Choi Tse-keung said that the voter turnout yesterday was vastly different from the initial assessment by the two parties because they had overestimated public response to the "referendum." As a result, the two parties pushed themselves into an awkward position. He said that the people have not accepted the notion of a "referendum" and they also could not vote "on the issues instead of the personalities." "The highest voter turnout was in Kowloon West, because when people will vote when there is competition between people." Chinese University of Hong Kong Political and Administrative Sciences Department associate professor Ma Ngok said that the voter turnout was lower than he anticipated. The Civic Party and the League of Social Democrats were not able to completely obtain the votes for the pan-democratic camp in 2008, so this showed that more than 300,000 middle-of-the-road pan-democrats who do not agree with the action taken by these two parties. One Country Two Systems Research Center chief executive officer Cheung Chi-kong thought the voter turnout was low because the two parties were unable to attract moderate pan-democrats. He said that the two parties obviously "miscalculated" this time when they thought that the pro-establishment camp would participated in this by-election. But no matter what the outcome is, the two parties will be able to come up with a reading of the results such that they "attained victory" in the by-election. City University School of Continuing and Professional Education program coordinator James Sung estimated that the voters were mainly the basic supporters of the two parties plus some new young voters. The two parties did not "steal" too many voters from the moderate pan-democrats such as the Alliance for Ultimate Universal Suffrage. The Democratic Alliance for the Betterment of Hong Kong said that the new low in voter turnout showed that the majority of voters refused to participate in this meaningless and wasteful election. Voting began yesterday morning at 7:30am. The voter turnout rate slowly increased by 1% or so each hour. The atmosphere was bleak around the various districts. The streets look no different than normal, as there were not competing campaigners canvassing for votes. Some citizens said that this was an unnecessary by-election and therefore they did not want to vote. Chinese University of Hong Kong Political and Administrative Sciences Department senior lecturer Tso Chi-keung pointed out that the two parties set their success/failure criteria too high initially. But when no competition emerged, they had to adjust their targets downwards in order to ensure that they stand on an undefeatable moral high ground. In the end, this only pushed the voter turnout down and disappointed the public. He stated frankly that the voter turnout cannot show that the de facto referendum was successful.